This is one of those places you only get to see if you are willing to drive over twenty miles of washboard roads. 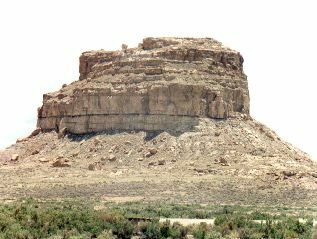 Fajada Butte, at the eastern end of Chaco Canyon, is unique in the ancient world in marking on one surface the significant cycles of both the sun and moon. Standing 135 meters above the canyon floor, three large sandstone slabs on an upper shelf cast shadows of the late morning and midday sun on a spiral petroglyph to indicate both solstices and equinoxes as well as the major and minor standstills of the moon. The juxtaposition of the sun, the slabs of rock and the petroglyphs have been consciously arranged so that at the apporpriate time of year, the engraved spirals are bisected or edged by vertical shafts of light, coined 'Sun Daggers'. Many ancient people marked the progress of the sun in its annual cycle by noting features corresponding to its rising or setting on the distant horizon. When morning or evening skies were overcast, the observatory on Fajada Butte ingeniously allowed for midday readings. During the Late Cretaceous (75-80 mya), this area was part of a shifting coastline of an inland sea that covered the western interior of the U.S. 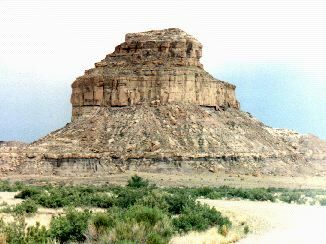 The Butte is capped by Cliffhouse Sandstone. The oldest rocks exposed in these pictures are part of the Menefee Formation which is mainly mudstone but also has thin beds of both shale and coal interspersed between sandstone layers. Many of the Spanish names for the promininent features of this landscape are visually instructive; fajada means skirt and refers to the steep slopes of the Menefee coastal plain deposits which spread below the sheer sandstone cliffs.